Hello guys ^ ^ this is another seed wall from me, now featuring asuran n cagalli . i don't know what kind of wall it is..T T hopefully this one is quite good . but i don't think that the background fits that well to the chara on the left. Neat background effects. I like how you inlaid pictures from the series in the back. Yes, it looks like Athrun is starting to let Cagalli down. I love the choices of images. They work well together. Looks nice. I'll fav! 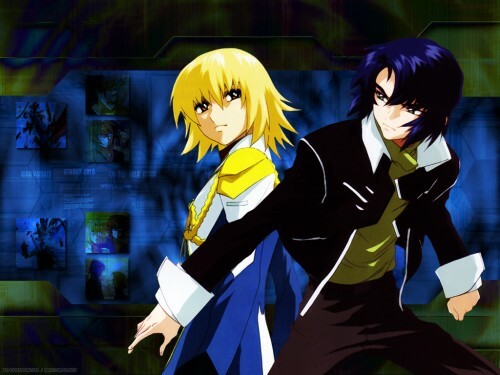 here a Athrun x Cagalli fan!! ^o^ hey this wallie is great! Lovw the Athrun scan, he looks so cool! And i never saw that Cagalli scans before! o.o The bg looks listurious and very cool! very nice job! Very sleek wallpaper. The scans of Cagalli and Athuran and awesome. I really like the blue of the background, but I'm not too sure about the green. I'm not sure if it goes with Athuran's shirt. ;) I do like the little pictures from the series in the background. And the title is cool too. Very nice. A pair of lovers who have the personality very much, I like very much, thank the picture that you sent, hope to send other more ! Nice wallpaper !! Nice colour too, very cool and great !! Thank for sharing it with us !! Nice job !! you guys really support me ^ ^ Arigato Gozaimasu all!!! Really very pretty!!! Well, i love Athrun and Cagalli together, they just look so cute! And... the background is dfinitely beautiful, with some screencaps and the teach-lines and stuffs. And it's really kinda dark too, it makes my eyes at ease! I'll add it to my favs! Nicely done there, yo-chanbokura! Extraction was good and the background works well. With all the girls chasing Athrun I hope Cagalli finally stakes her claim on him by the end of the series. Thanks for sharing!